I write this knowing that there’ll be very few who read my opinion, compared to the millions for your recent tirade against God. Apart from the Pope, or perhaps Bono… even learned and accomplished believers get little coverage compared to you and Dawkins and all of the other famous celebrity atheists. You have an awful lot of power. Somehow The Archbishop of Canterbury doesn’t seem to go viral, he seems a nice man but he’s just not got the street cred I suppose. Most of the believers who get the headlines are the nasties like Westboro Baptist Church, and they’re about as representative of Christians as Stalin and his cronies are of atheists. As many of my learned friends have pointed out, your anger against God assumes that this world is the way he designed it to be. But it’s not, if we take a Christian view on the subject. It doesn’t take much reading of the Bible to see that the God described in those pages is not very happy with the world as it is. In fact when he’s most angry, in the much maligned Old Testament, then God’s raging about the lack of compassion for people in poverty, the murdering of children in pagan blood sacrifices or just plain selfishness and hate. Most clearly in Jesus’ teachings, you can see clearly that God wants people to care for one another, not to be greedy etc. Yet, we ignore him. The problems you cite in your rant on RTE – as with most of the suffering of the world – could be alleviated, if not eradicated, if human beings chose to love. (Not the fickle, randy, romantic kind of love that is usually what’s counted as ‘love’ these days, but the agape, compassionate, caring kind of love that Jesus talks about.) How? Well, we could be giving our money to the care of those children turned blind by worms, rather than spending it on nice meals out, posh clothes or sunny holidays. We could be adopting the orphans and tending to the sick kids – spending all our time caring for them rather than all the ‘leisure’ activities that us Westerners love so much. We could be studying for the ultimate purpose of relieving suffering and treating illness rather than just the learning for enjoyment’s sake that we tend to do – or the learning we do to make ourselves sound clever and be admired, even worse. We could be spending as little money as possible on ourselves, in order that we can give it to others. In short, we could be living lives of pure love, and focusing all of our time and energy on relieving the suffering of others. But, we don’t. 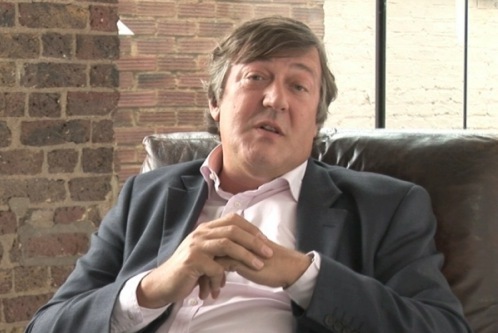 You and I, Stephen Fry, do not do that. Even the people I know who do a much better at it than I do, still obviously fail at it on a regular basis. This, according to the Bible, is why God is angry. He doesn’t want it to be this way, because he loves us. He created a world that was meant to be good, where humans were meant to love one another. But, we were given free will. We have many choices that we make each day, that could make the world a better place. They involve more than just giving a fraction of our handsome surplus or of our time to our favourite charity – it involves genuine sacrifice of our whole lives for the sake of others. We’ve been given that responsibility. And most of us have it in our power to do something about it, however small that something is. If everyone used their little bit of power for love’s sake, then most of the evil in the world would either be stopped at source, or at least alleviated. It’s no use shouting at God for the evil we claim he is responsible for. He’s given us the power and the free will, to make things different. And we choose not to do that. Heaven is the place where what God wants is done perfectly, not here. He’s given us the reins while we’re on Earth, and we’re doing a hopeless job of being in charge. Jesus was pretty clear, when he was asked by a rich young man how to be good enough get to heaven. He said, we’re to give all our money up for the poor – to the people who are genuinely suffering. The rich young man was sad, as I suppose we would be too, if told we had to give up our comfortable, Western lives, to help those who are suffering today. His disciples were too. But thankfully, Jesus had more to say – “nothing is impossible with God”. Christianity is not about us being good enough, but instead recognising that God is good enough. That’s pretty good news given the very clear reality that there’s no-one who’s perfect in this world – no-one who is giving up everything for the sole purpose of genuine self-sacrificial love of others. It says that Jesus saw this problem, and decided to take on the negative consequences of all our selfishness so that we can be free of it. If we choose to, we can accept this free gift, accept our own responsibility for the problems of the world and say sorry to God for this – and then learn from Him how to love better, love more, and relieve suffering. But we have to recognise that we can only do this, by turning to God, for his leadership and his love. On our own, we just don’t manage it. Now you might say, with good reason, that the church is not presenting this utopia to the world. We’re not the perfect houses of love that we’re meant to be. That’s very true. There are some pretty irritating and occasionally nasty people within church walls – such as myself, I would say. But I came from a very typical liberal, secular culture and then moved into the church after I became a Christian as an adult. No, it’s not perfect, but when you find a genuine church that is truly seeking to follow Christ, then you do start to see something a little bit different. You see glimpses of the way the world is meant to be. Not a window, but just glimpses. A drug addict who has been healed and now has a happy family and is holding down a job. A church rallying round a mum whose disabled daughter and poorly husband have left her exhausted. People who give up well paid and powerful jobs in order to go and practically help the suffering in other countries. Those who suffered terrible abuse as a child who find peace through faith, and start to give their lives to help others. These are glimpses of heaven, and of the way the world is meant to be. Sometimes those glimpses are seen outside the church, it’s true, but in my lifetime I’ve most often seen self-sacrificial love within the church. It’s not a wishy-washy, State-dependent, ranty, political kind of ‘love’, either (though there is quite a bit of that too, to be fair, it not being perfect). There’s a ‘taking on of responsibility’ kind of love, making things happen with our own hands and not blaming the government or whoever else for the problems. It’s recognising the massive responsibility that has been given to humans to choose. To choose whether to obey God’s commands for genuine love and to avoid greed and suchlike – or not. To choose his way, his redemption, or not. I think that we’re living in this world where God’s will is not done, to see whether we want to live in the world where his will IS done – heaven. There, is pure joy and pure love, with no greed or selfishness at all. If you don’t want to follow his way of love – loving God, loving people, and recognising that the world’s problems are our fault and saying sorry for that – it’s your choice. But you might find out that who you should really be angry with, is not God, but yourself, myself, and everyone else.